The Jehovah’s Witnesses step up their newsletter campaign. Looks like this trapped family can fend for themselves. What on earth is the dude with the flail (that most overrated of melee weapons) carrying in his pocket, a package of frozen squash? Only one family is trapped? For a city wide holocaust Emergency Services seem to be functioning in a splendid fashion. These Death Wish 3 rejects were probably driving all around town just to find a fire to pose in front of. Once you realize that the guy in the middle is wearing a tiny little organ grinder monkey’s hat, the whole tone of the cover changes. They look pretty well put together for post apocalyptic gangstas. I would have expected their clothes to be a little grubbier. Maybe a well placed facial scar or two. Shouldn’t this be “Night of Power Outage”? These are not experienced thugs, these are men new to the job of being thugs, and you can tell by how clean they are and how awkwardly the one in the middle is holding his (sawed-off?) shotgun. And that one of them is posing as a Jason Voorhees knockoff. Early John Carpenter soundtrack not included. The book is helpful labeled ‘science fiction’ in case the chain mace didn’t give it away. Warriors… come out to plaay-ayyy! These cover-boys look meaner and tougher than most of the Warriors’ cast. Which isn’t much praise. 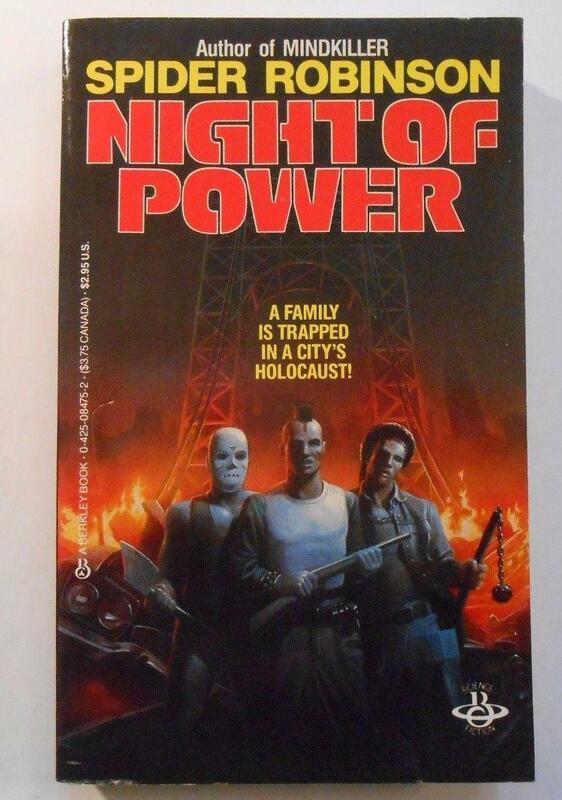 Did the people who brought us “The Purge” movies stumble upon this cover in their misspent youth?